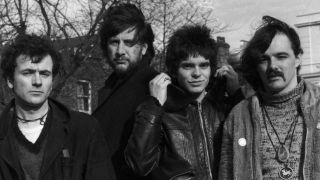 JJ Burnell tells of writing suicide note after "artistic decision to see what would happen"
JJ Burnel and Jet Black have recalled the time The Stranglers decided to take heroin for a year – leading to bassist Burnel deciding to commit suicide. They began taking the drug on a daily basis while making fifth album The Gospel According To The Meninblack in 1980. As the band mark their 40th anniversary, Burnel tells The Guardian: “It was an artistic decision to see what would happen. Jet and Dave Greenfield were sensible, and quit after a day – Hugh Cornwell and I didn’t. We headed into a surreal, dark, necromantic abyss. The Meninblack explored the concept of aliens visiting Earth – and drummer Black recalls a chain of mysterious happenings while they worked on the album. He says: “It was based on this phenomenon, back then known only to a small coterie of UFO obsessives: that people who saw UFOs were visited by strange people wearing black to shut them up. The Stranglers are on the road until the end of the month. An 11-disc retrospective box set, Giants And Gems, is released via Parlophone on March 24.